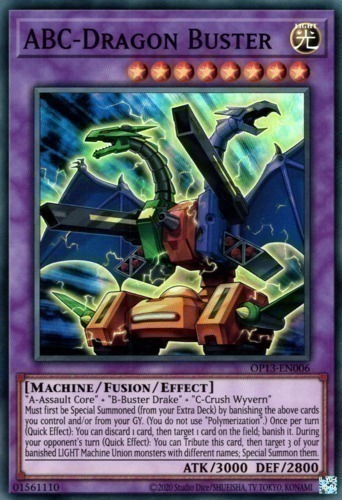 Text "A-Assault Core" + "B-Buster Drake" + "C-Crush Wyvern"
Must first be Special Summoned (from your Extra Deck) by banishing the above cards you control and/or from your GY. (You do not use "Polymerization".) Once per turn (Quick Effect): You can discard 1 card, then target 1 card on the field; banish it. During your opponent's turn (Quick Effect): You can Tribute this card, then target 3 of your banished LIGHT Machine Union monsters with different names; Special Summon them.